Most educators and psychologists today agree that the single most important period in the development of a person’s intelligence occurs between birth and age five. A child’s mind is extremely absorbent and his curiosity is at a peak these early years. When properly nourished and stimulated, the child’s mind forms patterns for learning that serve him well throughout his life. The Montessori system of preschool education has proven to be one of the most effective and fastest growing methods to guide a child through these critical years. Day Care Centers are generally for the purpose of caring for children on an all day basis. 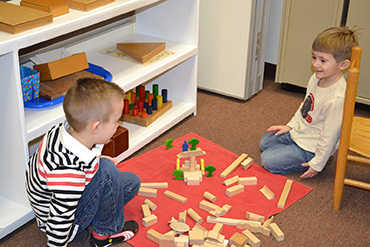 Nursery schools are generally experiences in socialization and play. 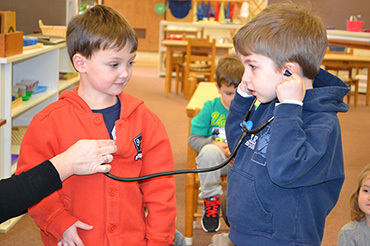 Preschools are oriented toward educational experiences combined with socialization and play. How is Montessori Preschool different from other preschools? The Montessori method of education is basically a unique approach to learning. Rather than “teaching” the child concepts, an environment is designed to stimulate the child’s interest and facilitate his understanding and learning capacities spontaneously—with little or no adult intervention. The main purpose of the Montessori method is to develop an environment where the child can unfold spontaneously and manifest the greater person within. According to Maria Montessori, “the child is the father of the man.” As the child begins to develop this inner self, his love of life and learning expands continuously. Dr. Maria Montessori, over 70 years ago, was Italy’s first women medical doctor. Using her scientific background, she began observing children in the children’s houses of Rome. Based on her unbiased observations, she developed unique materials, a child-centered environment and was one of the first persons to revolutionize educational thought, by stressing respect for the child, freedom of expression, self-education and training through use of movement and the senses. What is a Montessori classroom? The Montessori classroom is a child-size world. Whatever is in the world outside can be incorporated meaningfully in the Montessori classroom. To a child, the world is unmanageable—it is too big, too complex and too confusing. By careful selection of materials an environment is set up which allows the child to explore life on a level he can understand. The materials or exercises are designed to stimulate independent exploration. This prepared environment entices the child to proceed at his own pace, from simple activities to more complex ones. Through this process the child’s natural curiosity is satisfied and he begins to experience the joy of discovering the world around him. Materials and curriculum center around practical life, sensorials, language, math, geography, science, art, music, drama and dance. As the children develop a sense of pride in their “work,” a feeling of confidence, well-being and joy begins to manifest itself in the child. A “new child” is born. A classroom of Montessori children is a joy to watch. There seems to be a spirit of respect, love and cooperation among the children that is not found too often in that age group. The concept of freedom within the classroom is one of freedom within limits. A child is allowed to work freely so long as he does not disturb others. Actually, the children having the freedom to follow their interests are happy and busily involved with their work. What is the best age to start a child in the Montessori program? Maria Montessori outlined various periods of “sensitivity.” During these times a child is more capable of , and interested in, learning specific concepts. At age 2.5 to 3.5, a special sense of order, concentration, coordination and independence begins to emerge. This time is ideal to begin a child’s training in Montessori, as he is at the perfect age to build a strong foundation for future learning. Children who have been in a Montessori environment are generally very flexible and adjust quite easily to the public school.